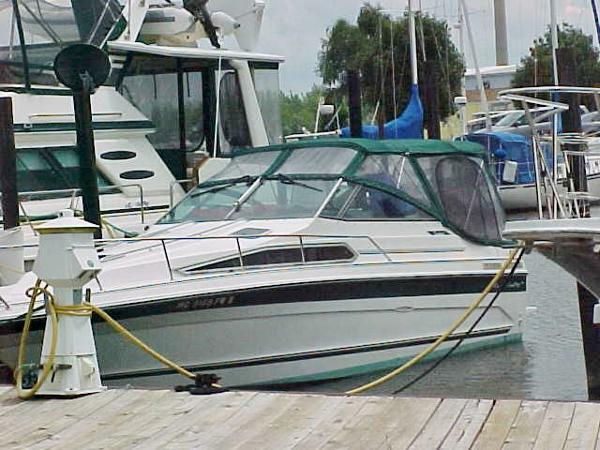 1987 Sea Ray 268 Sundancer 1987 Sea Ray 268 Sundancer SALE PENDING, 1987 Sea Ray 268 Sundancer. Well preserved example of this popular cruiser. 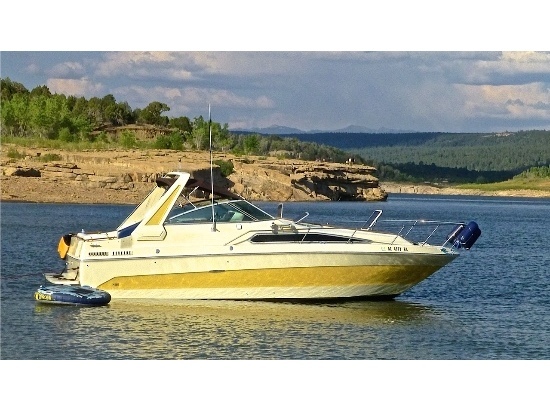 Single Mercruiser 7.4L 330 HP with Alpha One outdrive has 800 hours. Oil changed every 50 hours and heated winter storage. Updates include Air conditioning with reverse cycle heat, vacuflush toilet with 12gal holding tank, extra wide Bertram four step folding boarding ladder, 2nd large capacity house battery with selector switch and battery charger, full cockpit snap in carpeting. 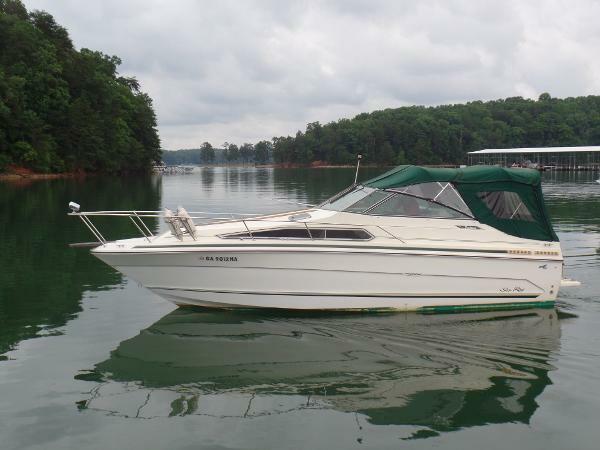 Boat includes Garmin 182C GPS, full engine instrumentation, and depth finder. Teak trim and bow pulpit with anchor locker. Danforth anchor with twenty feet of chain and 150 foot rode. In the cabin re-upholstered dinette to port across from galley with two burner electric cooktop, refrigerator, and sink with hot and cold pressurized water system. Filler cushions for V-berth and dinette. Flat screen TV on aft bulkhead. Full Camper canvas package and mooring cover. All canvas windows replaced with Eisenglass, all new screens. Adjustable helm seat with flip down seating behind and pull out beverage cooler and storage. Aft cockpit flip up bench seat and door to swim platform. Dimensions: 8 6 Beam and 27 6 OAL. Fuel 100g, Water 25g, Waste 12g. Owners moving up to larger boat. $11,500 Firm. Available for viewing in off season. 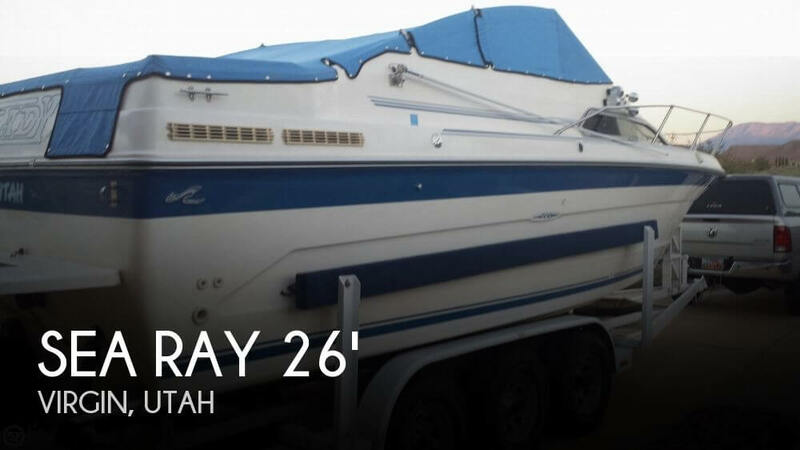 1988 Sea Ray 268 Sundancer This is a Very clean and very well maintained 1988 Sea Ray 268 Sundancer powered by a Mercruiser 7.4L 330hp motor with only 330 Freshwater only hours on it! 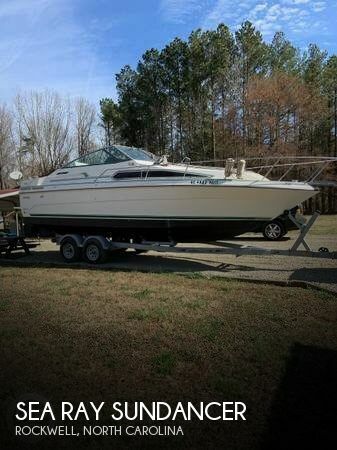 Boat comes with Double Bimini tops, Full enclosure, Extended swim platform, Remote spotlight, Full Galley with sink, fridge and cooktop, Compass, CD/stereo, enclosed head, 6 gallon hot water heater, snap in cockpit carpet Trim Tabs, VHF radio. Sleeps 6. $15,995.00. 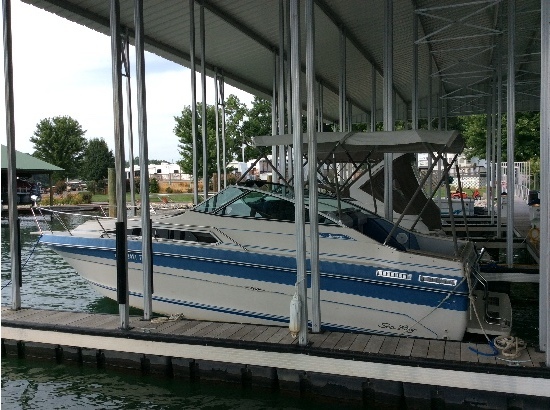 For more information on this Sea Ray or almost 100 pre-owned boats in stock call or email American Boat Brokers Today! 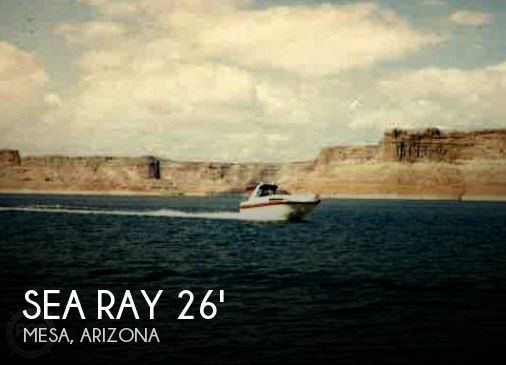 1986 Sea Ray 268 Sundancer, Sea Ray Sundancer cabin cruiser with only 34 freshwater hours on a new 5.7L Mercruiser 260 hp engine tuned for elevation with new high altitude Sterndrive. 100 gallon fuel tank. Self contained cabin with front and rear births, pump out head, refer, stainless sink, induction cooktop, dining area, a 24 gallon water tank and 6 gallon water heater. Can sleep 4 adults and a couple of small children. Has slide anchor with rode and bow line. Cockpit cover and rear zipped and windowed canvas enclosure. 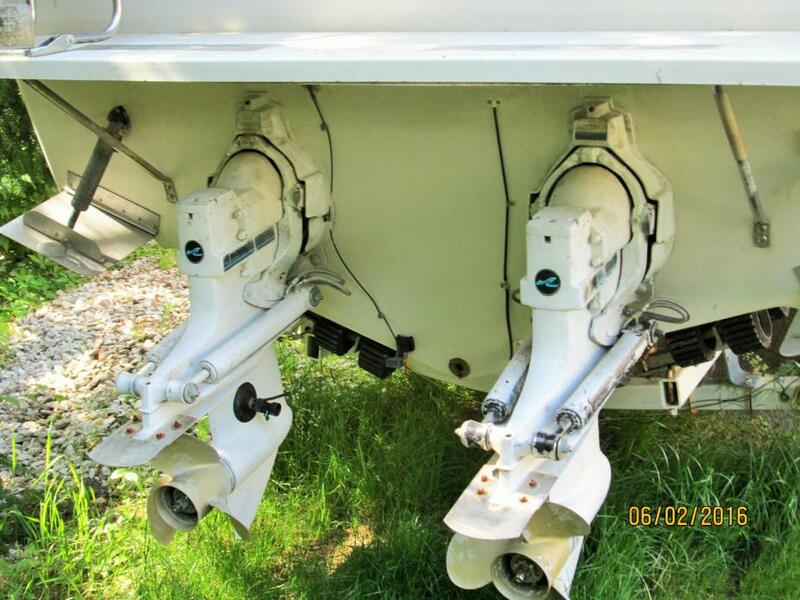 Gauges, shore power cord, trim tabs, 4 fenders with holders. Rear seat can be reversed for fishing or a rear view toward the swim deck. Considerable storage. Helm seat with flip-up bolster and pivot. Auto fire extinguisher in engine compartment. Garmin GPSMAP model 531, Uniden (UM380) marine radio. Have manuals for most mentioned items above. dual marine batteries. Power steering. All surfaces newly upholstered inside and out. 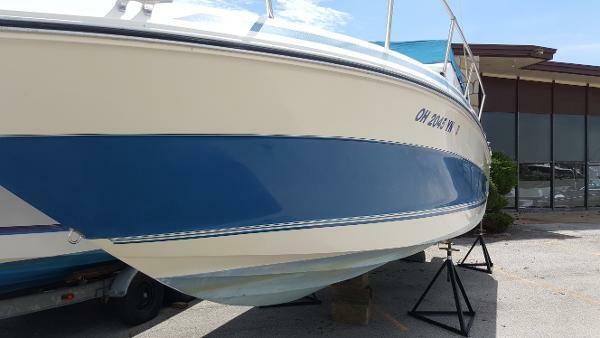 Upon winterizing last year I had the boat gone through by a local detail oriented boat repairman and had him go ahead and fix or replace and/or adjust all discrepancies that he found. List of items available. New surge brakes and master cylinder on the Crown Line dual axle trailer. Tires are good and has a spare. I tried to take good sharp photos to accurately represent the condition of this boat but feel free to ask any questions or for any more detailed photos of areas you would like to see better. We have been tightening this boat up with the intent of spending lots of time on the water. But things change and we decided a smaller boat that we can more easily cart around the country will better fit our travel plans. We're hating to see her go and have been back-and-forth on it but plans do change. $14,750. Reasonable offers considered. 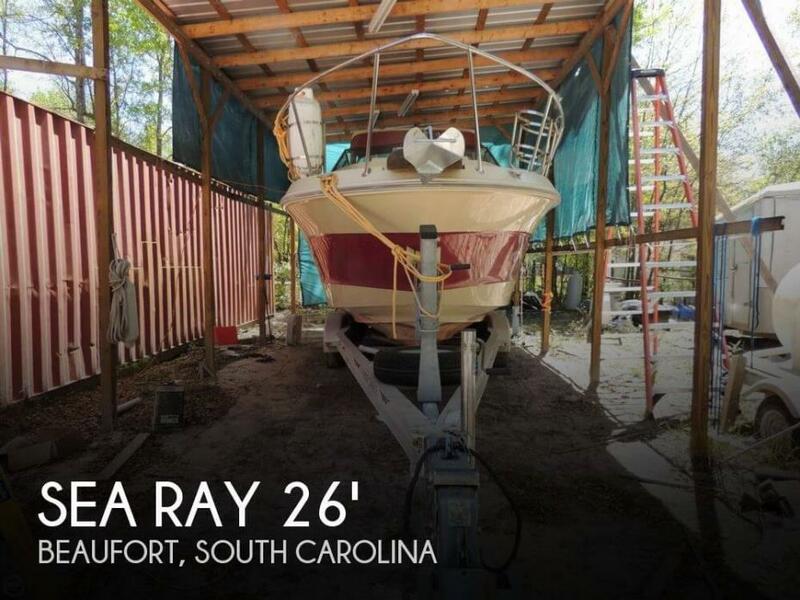 1987 Sea Ray 268 Sundancer 1987 Sea Ray 268 Sundancer (26’7” X 8’6”), MerCruiser 454 Magnum 330HP A1, ’87 EZ Loader tri axle Galvanized roller trailer with tri axle brakes. This boat is Sand White and Burgundy. The cockpit Floorplan has a double wide helm seat with fold down rear facing seats & a stbd side transom walk thru Passage with door. Helm features include VHF radio, Ritchie Compass, Garmin fishfinder, stbd windshield wiper, in dash circuit breakers, 5” remote control spotlight, hydraulic trim tabs, SST steering wheel & full instrument pkg. Cabin features include a large forward V-berth with filler cushions and privacy curtain. The port side dinette area converts with filler cushion To a 2nd sleeping area. The aft cabin provides a 3rd sleeping area & it has a privacy curtain as well. The boat Is equipped with a full galley with dual burner alcohol/electrical stove, dual voltage 12/110V refrigerator, 110V outlets & SST sink. For natural light & ventilation it has 3 opening deck hatches with screens and Drapes as well as side windows with blinds. The enclosed bathroom has a pump out head and sink with Mirror. Other features include hot water heater, dual battery system with switch, fire suppression system, Mercathode teak cockpit table, custom made light, SST fender racks, bottom paint, teak bow pulpit, cockpit Cover with separate front deck cover, full camper enclosurepackage & teak rack covers. 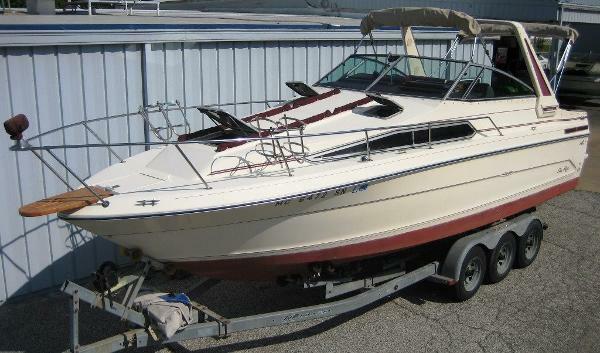 This boat is in Excellent condition with only 699 hrs use. 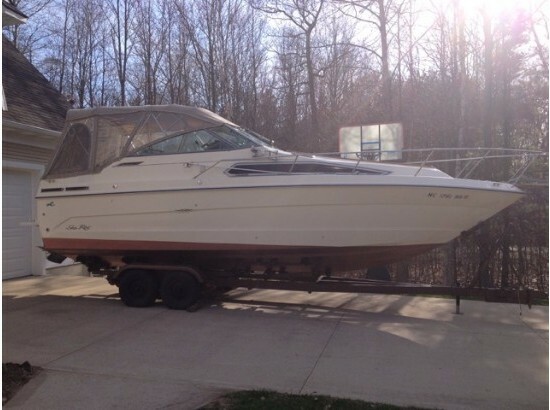 1987 Sea Ray 268 Sundancer, 1987 Sea Ray 268 Sundancer on trailer. 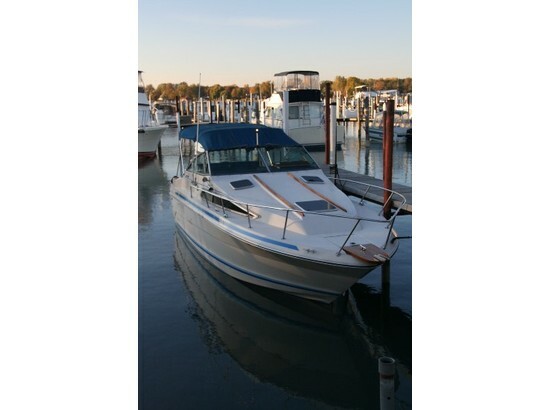 Excellent condition, 2nd owner boat, never used in salt water. 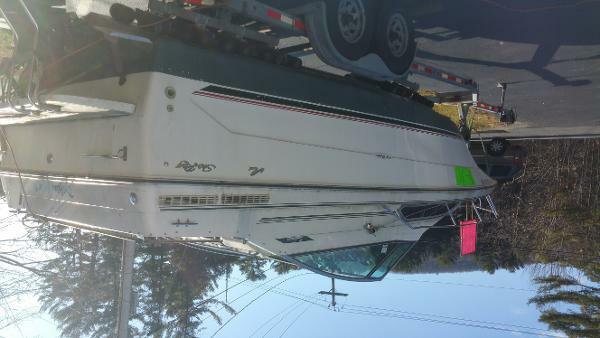 Mid-cabin express cruiser, Twin 4.3L V6 engines w/alpha drives and 500 hours, shore power, windlass anchor, hot water heater, stand-up shower, pump out head, two burner elevated cooking top, refrigerator, newly rebuilt trailer- sandblasted and power coated, bearing brakes, wheel cylinders, lights. 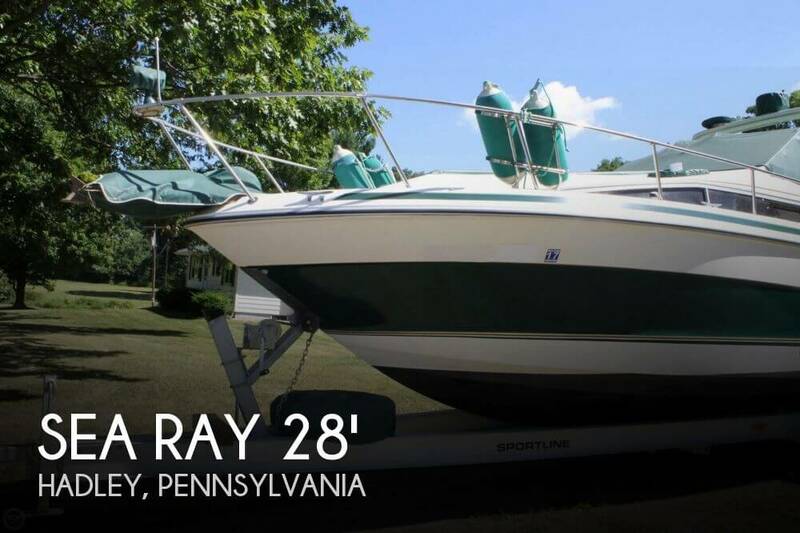 Discounted slip available at Brookfield Bay Marina on Candlewood Lake.